High quality heavy weight 100% cotton twill tailcoat. With beautiful floral pattern / black thread embroidery, its a victorian embroidery theme taken from the 18th century artwork. There is no cheap patch work but each suit is individually crafted with high standards. Made from rich black cotton fabric (heavy grade 100% cotton). Fastens in front with hooks and eyes and has a double row of ornamental buttons fully lined in sleek black satin. 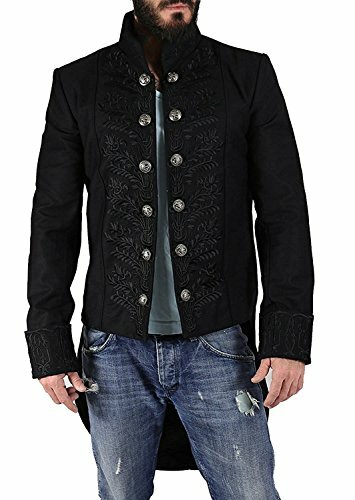 This awesome coat is equally suited for the ballroom or the high seas! If you have any questions about this product by Eimee, contact us by completing and submitting the form below. If you are looking for a specif part number, please include it with your message.